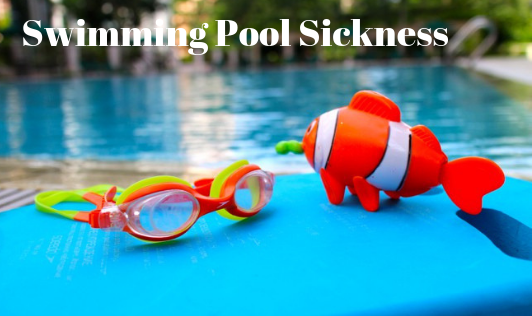 What Is Swimming Pool Sickness? What is the swimming pool sickness? A variety of illnesses like diarrhea, ear infections, skin rashes, respiratory infections, and eye infections may be caused soon after using the swimming pool. The chances of swimming pool sickness rise in summer as the number of people using the pool are more. Causes: Chlorine is used in swimming pools and Jacuzzis to kill germs. When the action of chlorine fails, the germs cause infections. The levels of chlorine are reduced by sunlight, dirt, and germs from the swimmer's body. Therefore, pools should be checked several times during the day to adjust pH levels. Symptoms: Gastroenteritis, diarrhea (caused by E.coli or Pseudomonas), nausea and vomiting, fever, muscle cramps, itchy rashes over the body, blisters, sore throat and infections of eyes and ears are common. Precautions: • People with a compromised immune system should be extra careful. • Shower with warm water before and after entering a swimming pool. • If the pool water looks cloudy, avoid entering it. • Do not drink or swallow pool water. • If you notice dirt or feces in the pool, inform the lifeguard immediately. Take care of hygiene, take precautions & prevent yourself from such kind of sickness when you decide to go into a swimming pool!